(Nanowerk News) With more than five times the thermal conductivity of copper, diamond is the ultimate heat spreader. But the slow rate of heat flow into diamond from other materials limits its use in practice. In particular, the physical process controlling heat flow between metals and diamond has remained a mystery to scientists for many years. By applying extreme pressure in a diamond anvil cell to metal films on diamond, researchers at the University of Illinois at Urbana-Champaign have now determined the physical process dominating this unexplained heat flow, which has implications for understanding and improving heat flow between any two materials. "Overheating has become a major limiting factor in the performance of high-power RF devices," said David Cahill, a professor and head of the Department of Materials Science and Engineering at Illinois. "Modern RF electronics for wireless devices such as satellites and cellphones generate so much heat in a microscopic area that the packing density and performance of RF devices isn't limited by Moore's Law anymore, so much as by how fast we can pull heat away from those devices. For overheating at microscopic length scales, it's not enough to just swap out silicon for diamond; we need a microscopic understanding of how heat enters materials like diamond." Cahill explained that this work lies more on the fundamental side of thermal physics research, although materials like diamond and silicon carbide are being actively developed as alternative substrates for high powered radio-frequency (RF) devices. "Studies of extremes like metals on diamond at high pressure are valuable because they allow us to test our ideas about what is happening in this complex problem. The experiments we designed let us test and falsify a series of hypotheses, ultimately leading to a better understanding of heat flow between dissimilar materials." "The simplest way for a phonon to cross an interface is by a two-phonon elastic processes: a phonon comes in, a phonon of the same frequency goes out." explained Greg Hohensee, first author of the paper appearing in Nature Communications ("Thermal conductance of metal–diamond interfaces at high pressure"). "But metals on diamond are a special case. The diamond is so stiff that it's like banging a pot attached to a rope and expecting the rope to dance. The vibrations stay in the pot, because the rope is not stiff enough to carry such high frequency vibrations. Likewise, you can't make the pot sing by shaking the rope. But somehow, metals on diamond are doing exactly that." The thermal conductance of an interface determines the rate of heat flow for a given temperature difference between the materials. Typically, the carriers for heat in crystalline materials like diamond are traveling vibrational waves called phonons. A central challenge of thermal physics--and of interfacial thermal conductance, specifically--is that phonons exist over a wide frequency range, and how phonons interact with interfaces and other phonons depends on their frequencies. "Stiffer metals seem to have higher thermal conductance on diamond, so our initial hypothesis was that the thermal conductance depended on the metal's stiffness," Hohensee added. "We designed an experiment to vary the stiffness in a controlled way. 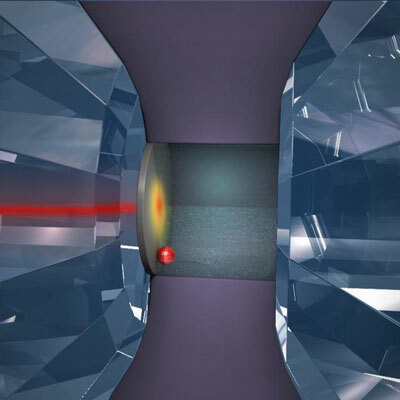 We deposited different metal films on one of the two diamond anvils in a diamond anvil cell, sealed the cell with a gasket between the diamonds, and measured the thermal conductance to pressures as high as 500,000 atmospheres. You'd have to go 1000 km into the Earth's mantle to find comparable pressures outside of a laboratory." "To our surprise, the initial data with a gold-palladium alloy (Au(Pd)) and lead (Pb) showed no such trend," said co-author Rich Wilson. "In fact, the conductance seemed to saturate at high pressure, as if by some limiting thermal resistance between the metals and diamond. Proving yourself wrong can sometimes seem like a letdown but each falsified hypothesis brings you closer to the correct explanation. To inspire a better hypothesis, sometimes you just have to go back and collect more data." "To get the additional comparisons, we measured platinum (Pt) for electronic contrast against Au(Pd), and aluminum (Al) for stiffness contrast against Pb," Hohensee said. "A pattern emerged: the Pt and Au(Pd) data were similar, but the excess conductance of every metal aside from Al were nearly identical at high pressure. "We realized that we could explain the data with what we call partial transmission processes, where metal phonons 'feed' a much higher frequency diamond phonon at the interface. We had originally guessed that metal phonons could combine to form a higher frequency diamond phonon, but that process would have been sensitive to the metal stiffness and hence pressure. In partial transmission any diamond phonon can eat a metal phonon, even diamond phonons with frequencies far higher than can exist in the metal, so it hardly matters how stiff the metal is." "Before this experiment, researchers had been proposing and modeling theories for metal-diamond thermal conductance for some twenty years, based on data as a function of temperature," Cahill said. "We designed a new experiment with a new independent variable, pressure, in order to test these hypotheses. Our new information ended up falsifying some theories and supporting a new picture for how heat flows between dissimilar materials in general. Now that we know partial transmission processes can be important, researchers can build microscopic models and simulations to explore them in more detail, and engineers can design devices that enhance or take advantage of this aspect of thermal conductance for a variety of materials."